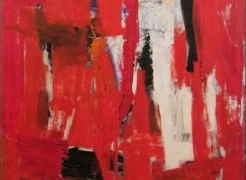 Signed, titled, inscribed, and dated verso: "J. Tobias / 'REFLECTIONS' / SIZE 60 x 72 / YEAR 1960"
Signed and dated lower right: "Tobias 60"
Signed, titled, inscribed, and dated verso: "J Tobias / 'PÉCAÏRE!' / SIZE 61 X 49 11/16 / YEAR 1960"
Hollis Taggart Galleries presents its first exhibition of paintings by Julius Tobias (1915-1999), Julius Tobias: Capturing Space, Paintings from the 50s & 60s. During this period, Tobias became a fixture in the growing art world in New York, where he returned after his education at Paris’ Académie Fernand Léger. The city became fodder for his grand compositions as his commitment to abstract form encompassed his deep sympathies for the found abstractions of urban life. Indeed, he claimed that “there is no such thing as abstraction as differentiated from reality--all abstraction is based on reality and is reality.” (1) This is the first time in over 50 years that Tobias’ monumental paintings have been publicly exhibited.